BIG SALE!! CRYSTAL GLOBE PAPERWEIGHTS BIG SALE!! 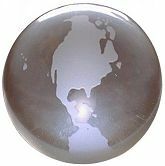 Super high quality 3 1/3" wide Crystal World Globe paperweight has acid etched continents and a flat free standing bottom. This eye catching World Globe is a must have desk ornament for the mogul power player and aspiring CEO! An attractive acid etched Crystal World Globe sits on a beveled square shaped crystal pedestal stand. This is a great gift and attractive desk accessory with a small footprint. 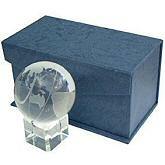 Excellent quality, crystal world globe boxed set in 2 sizes. Beautiful 60mm or 2 1/2" Crystal Globe with the continents and oceans delineated, pivots on a polished solid brass caliper stand. This is a great gift and for the up and coming global business executive. High quality clear crystal globe with brass caliper stand set. 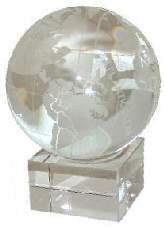 DeLuxe 110mm or 4 1/2" Crystal Globe ball/sphere sits on a large square crystal pedestal stand. This is the most have executive desk accessory for the sophisticated business professional. Highest quality clear crystal globe boxed set. 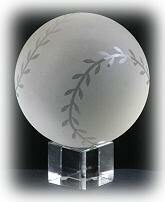 What better gift for the Baseball enthusiast than a Crystal Baseball set on a matching pedestal base. Instead of a crystal ball the avid baseball fan can call the odds with this baseball set on his or her desk. High quality crystal Baseball with base boxed available set in 3 sizes. The Crystal Baseball is flat bottomed and can be used without the base. 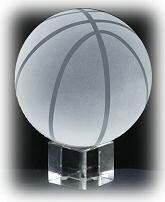 An eye catching Crystal Basketball sits on a beveled square crystal pedestal stand. This desk accessory is sure to bring the conversation to the favorite subject.... Basketball duhh! High quality crystal Basketball with base boxed set is available in 3 sizes. The Crystal Basketball is flat bottomed and can be used without the base. 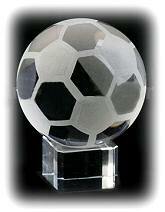 Hard to find Crystal Soccer Ball with matching crystal base in 3 sizes! Any budding Soccer player can dream of trophies to come with sporty desk accessory! High quality crystal Soccer Ball with base boxed set is available in 3 sizes. The Crystal Soccer ball is flat bottomed and can be used without the base. 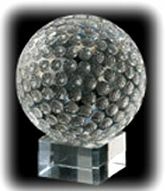 An eye catching Crystal Golf Ball sits on a beveled cube shaped crystal pedestal stand. This is a great gift for the avid golfer and an attractive desk accessory with a small footprint. High quality crystal Golf ball with base boxed set is available in 2 sizes. The Crystal Golf ball is flat bottomed and can be used without the base.